Fair exhibitors who are interested in participating in the Market Chicken or Market Duck with “Project” birds (Eligible for Rate of Gain) must have their project birds ordered by Friday, April 26 using the official Poultry Project Order Form. A “Project” bird is eligible for the Rate of Gain Contest as a market chicken pen or a market duck pen. Those exhibitors who do NOT wish to enter the Poultry Project may purchase their market birds through any source or raise their own and may still show and sell their market chicken pen and duck pen exhibits. Pricing on the birds is set at $1.60 per chicken and $4.00 per duck. When ordering plan for three birds in a market chicken and three in a market duck pen at the fair so you will want at least three birds and likely more to make sure to have three uniform birds. Order Forms are available by clicking here and orders must be prepaid. Birds will tentatively arrive the week of May 20, 2019 and you will be contacted by either Clay Mills or an associate at Family Farm & Home. You will have 24 hours to pick up your bird or they become the property of the store. To sign up for project birds complete the registration form and mail it along with a check for the birds to Clay Mills, 7780 Hill Rd., Ashley, MI 48806, or for more information contact GCFFY Poultry Superintendent Clay Mills at (989) 763-1973 or clmills@casair.net. Online animal registrations are finally coming to Gratiot County Fair for Youth. The fair is working with FormSite to create online registrations to register animals this coming year. 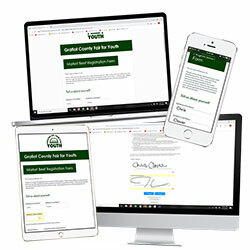 Beef exhibitors will be the first group to pilot the new registration process and the link to market beef online registration is now live at http://www.gcffy.org/fair_forms.html. Purchase an official 2019 GCFFY ear tag from either the fair office or our MSU Extension Office (4-H) partners. The cost is $1.00 per tag except for swine who will receive an official swine ID tag which is provided at no cost from the Michigan Department of Agriculture and Rural Development. Each animal you wish to register MUST have this official tag. Tag your animals with a tagger which works with Allflex tags. Exhibitors can register up to four animals when registering. Each animal MUST be tagged. When tagging animals it is highly recommended to have the ear tag facing on the outside of the animal for easy reading (and will show up easily on a photograph). Each exhibitor must have one animal listed as their primary animal on their registration forms. A primary animal listed for one family member may be listed as a back-up animal for another exhibitor, and the exhibitor is not required to exhibit their primary animal if they have a secondary animal registered. Take pictures of your project animals. Make sure your picture is a side view. If the ear tag is not readable in this side view picture, snap another shot with the ear tag clearly visible. The photo must show the ear tag hanging in the ear untouched. You will need no more than two pictures to upload. Make sure the pictures you will be uploading are stored on the device or computer which will be used to register your animal for each animal. Write down your animal's RFID tag (for beef and feeder) or Scrapie ID (for sheep and goats) that goes along with each GCFFY tag number and have this accessible when registering online. Click on the above link when ready and click the link for the correct animal. Since the Internet never sleeps, the forms will be due by 11:59 p.m. on the official due date. Applications submitted after that due date will require a $10 per business day registration fee. Follow the links and upload the photographs when prompted to upload them. After you submit your registration, a confirmation screen will come up and an email will be sent to the email address provided. Keep these as the official confirmation of the registration. If you have any problems with the registration from the fair, you will need to present this to guarantee your registration. The pilot of this process went smoothly and could be done simply on a phone as well as a laptop. The fair encourages patience as we unroll this process. If for some unforeseen reason there is a hiccup in the registration on the fair's end, accommodations may be made. 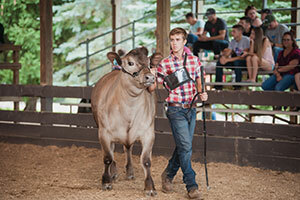 Gratiot County Fair for Youth is seeking qualified applicant to serve as the fair’s volunteer dairy superintendent. Candidates should be organized, have basic knowledge of how a fair animal show runs, and most importantly interact well with our youth exhibitors, volunteers and parents. Applications for either position are available at http://www.gcffy.org/parts/Superintendent_Application_2009.pdf and are due by Wednesday, April 10. The official superintendent job description is at http://www.gcffy.org/parts/super_agreement_desc.pdf. Contact the fair office with any questions at bgardner@gcffy.org or (989) 466-5071. 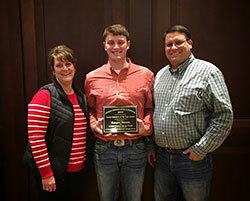 At the annual meeting of the Michigan Association of Fairs and Exhibitions, Keegan Humm was awarded their Youth Volunteer of the Year. This award is designed to showcase the contributions made by youth volunteers throughout Michigan to benefit fairs. For Gratiot County Fair for Youth, Keegan has taken on a leadership role in organizing the set-up of the fair’s parking areas. Keegan helped to plan, organize, set-up, take down and evaluate the parking areas since the fair changed to its new arrangement of parking. Keegan is also very active helping in the sheep department where he assists with set-up, clean-up and teaching exhibitors showmanship. Keegan also just completed his two year term as our fair’s teen representative to the Board of Directors where he was an active participant in board meetings. Gratiot County Fair for Youth thanks Keegan and all of our youth volunteers for helping to make their fair better. To participate in the fair's Dog Show, exhibitors must be members of the Pups-R-Us 4-H Club and follow their training schedule. The club will have an Information Meeting (without dogs) at the Bill & Grace Vanderbeek Fair Office on Monday, March 11, 2019 at 6:00 p.m. to go over new rules, fill out necessary paperwork and to answer questions. Click here for more information and a schedule of practices. Nothing is better than the feel of the soft fairway grass under your feet on a warm summer day as you line up for your perfect shot. The date for the annual GCFFY Benefit Golf Outing has been announced. The outing will be held on Thursday, June 20, 2019 at the Fields Golf Course in Ithaca. Mark your calendar and make sure not to miss this fun golf scramble. Following the golf outing will be GCFFY’s annual Road Sign Auction where you can bid to have the name of your choice on one of the fair’s roads during the week of the fair. Registrations will be online in March. There are plenty of good camping spots available for the 2019 Highland Festival. 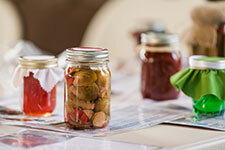 Each year GCFFY opens up its campgrounds to campers for this fun event. Sites all have water and electrical hook-ups and the fair has a bathhouse and two dump stations on our grounds. Rates and more information can be found by clicking http://gcffy.org/highland_camping.html. The Gratiot County Fair for Youth membership elected its 2019 Board of Directors at its annual meeting held in early December. Jake Cary, Kent Humm and Kipp Krenz were reelected for their second term and Jessica Truax was elected to her first term on the board. Hayley Cary was appointed to a two year term on the board as a Teen Representative filling a vacancy created at the end of Keegan Humm’s term completion. GCFFY thanks Mary Redman and Keegan Humm who are leaving their position on the board for their dedicated service to the Board and the fair’s exhibitors. Later that night the board elected Kent Humm as its President, Jake Cary as its Vice President, Martha Stellow as the Treasurer and Becky Hirschman as Treasurer. The complete list of board members is listed at http://www.gcffy.org/about_us.html. For more information contact the fair office at 989-875-5292 or bgardner@gcffy.org. As reported earlier by GCFFY , anyone who participates with an animal project in the Market Livestock Sale must have a completed record book for every species they sell. This year, the fair has already updated the Market Swine Record Book and the Market Feeder Record Book. These books can be found at http://www.gcffy.org/record_books.html. The fair is working on updating beef, horse, sheep and dairy and may plan to update other record books this spring as well. A completed record book has financial records inside. To get a head start it is important to record their expenses to later put into the project record books. This spring, Gratiot County Fair for Youth will be constructing a new multi-purpose livestock barn. 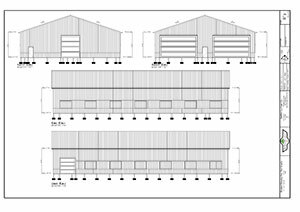 The new barn will be 64’ by 112’ and is designed to provide flexibility in penning animals depending on need at the fair. The fair will be purchasing the materials but is seeking separate bids for construction, concrete and electrical for the new building. Email info@gcffy.org for a copy of the blue prints. Bids will be due by 4:00 p.m. on Monday, February, 4. Construction is to be completed by May 31, 2018. 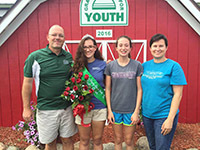 At the last Gratiot County Fair for Youth Board of Directors meeting, Shanna and Jared Smith were appointed as the fair’s new swine superintendents. Shanna and Jared served last year as the beef superintendents and Shanna serves on the fair’s Board of Directors. Previously, Shanna has served as the assistant swine superintendent. Shanna grew up with the fair showing livestock and her family has raised and showed quality show swine and Jared works in the swine industry. 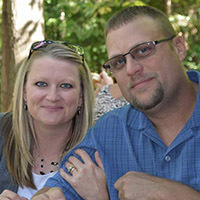 GCFFY is thankful to have the Smiths in this new role serving our swine exhibitors. The Gratiot County Fair for Youth Board of Directors also appointed Olivia Waldron as the fair's Companion Animal Superintendent at their last meeting. Like Shanna, Olivia grew up with the fair and continues to give back as an alumnus. Olivia served last summer as the interim Companion Animal Superintendent where she did an exceptional job. Olivia is also a recent graduate of Central Michigan University. GCFFY looks forward to continued work with Olivia in this position. Gratiot County Fair for Youth is seeking qualified applicants to serve as the fair’s volunteer beef superintendent and volunteer rabbit superintendent. Candidates should be organized, have basic knowledge of how a fair animal show runs, and most importantly interact well with our youth exhibitors, volunteers and parents. Set-up the market classes (by weight) and show and showmanship classes (by exhibitor age) and show. Applications for either position are available by clicking here and are due by Wednesday, January 30. The official superintendent job description is available here. Contact the fair office with any questions at bgardner@gcffy.org or (989) 466-5071. Gratiot County Fair for Youth is seeking a motivated individual to serve as a Summer Fair Intern and join the GCFFY team. The selected candidate will provide positive frontline support for GCFFY , accurately organize and manage fair exhibitor enrollments by utilizing existing database software, provide leadership to certain fair events, and effectively communicate with donors, sponsors, volunteers, exhibitors and other stakeholders. The position will run from mid-May through mid-August. Interested candidates should email a completed application, resume and cover letter to bgardner@gcffy.org by March 1. For more information, and an application visit http://www.gcffy.org/parts/2019_intern_position_packet.pdf or contact Brian Gardner at (989) 466-5071 or bgardner@gcffy.org. Must answer a question as an essay outlining the skills learned as a fair exhibitor and how those skills will serve you throughout your lifetime. Be certain to address the aforementioned criteria. Responses must be no longer than one typewritten page in an easy to read font. Also include at least one personal letter of reference. Cumulative high school (or college if applicable) transcript reflecting a cumulative GPA. Copy of the Student Aid Report (SAR) only providing the calculated Expected Family Contribution (EFC) from the Free Application for Federal Student Aid-www.fafsa.ed.gov. Other information as listed in the scholarship criteria section at the end of this form for each scholarship for which you are applying. The application must be completed online no later than 11:59 p.m., Friday March 1, 2019, in order to be considered, no exceptions. Scholarship recipients are expected to attend the Foundation’s awards event in May. Details will be provided with award announcements. The scholarship is part of the GCCF’s impressive offering of scholarships to area youth and the deadline of March 1 is rapidly approaching. Applications are available at http://www.gratiotfoundation.org/1/280/scholarships.asp. For more information contact the fair office at 989-466-5071 or bgardner@gcffy.org. As the last fiscal year came to a close, GCFFY had 265 donors who helped the fair meet its funding equation for 2018. With every donation the fair grows stronger and is better able to complete its mission of providing our community’s youth an opportunity to showcase their accomplishments. GCFFY is fiscally strong which helps us provide our exhibitors with an educational and memorable fair experience in safe, functional and well maintained fair facilities. GCFFY appreciates every person who supports the fair through a donation of time or resources. Click here for a complete list of all 2018 fair donors. Mark and Raychelle Story have served the last four years as the fair’s swine co-superintendents. This year due to increased commitments at work for both they are stepping away from leading this large department. During their tenure they have seen the swine project area numbers increase steadily forcing them to work hard to find a way to house animals without having enough pens. Some accomplishments in their four years were working with Breckenridge Insurance Agency to purchase the swine gates in the arena. Using these new pens has dramatically increased efficiency of the shows. The Story team helped to create outdoor wash pens for the swine department to provide much needed inside pen space and has allowed more GCFFY exhibitors to wash their animals at one time. Mark & Raychelle have also helped to create a plan to increase multi-purpose pen space at the fairgrounds to create more flexible housing on the fairgrounds. “Mark and Raychelle are always helping our pig families,” states GCFFY Fair Coordinator, Brian Gardner. “They made sure every family had the information they needed and worked hard to ensure the swine show ran efficiently and fairly.” GCFFY thanks the Storys for their incredible service to the fair. Since 2013, Brett & Jeanne Fidler’s smiling faces have greeted exhibitors in the rabbit barn as they served as co-superintendents in the rabbit department. Brett & Jeanne are stepping back away as the superintendents of the rabbit/cavy department this coming year. During their time at the fair, Brett & Jeanne worked tirelessly to ensure exhibitors were well prepared and made sure the barn was set up and ready for exhibitors to check-in. This past year, Brett and Jeanne helped to successfully integrate cavy projects into the rabbit department. This move has helped GCFFY better align with American Rabbit Breeders Association standards which includes cavies. “It was at the show where Jeanne and Brett excelled as superintendents,” states Brian Gardner, GCFFY Fair Coordinator. 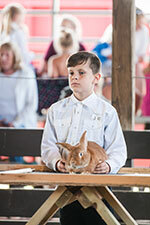 “Their enthusiasm for helping kids comforted parents and empowered exhibitors to do their very best.” GCFFY thanks the Fidlers for five great years showing rabbits. A common question of GCFFY exhibitor families is how can they get a camping spot on the fairgrounds for the fair. The fair first re-offers campsites to families who have camped with us during the last fair. These families have until mid-February to turn in their campsite registration paperwork (which is mailed out in mid-November). The fair will move families who indicate they want to move based on the vacancies left from campers who do not renew and then will offer the open spots to new families from the campsite waiting list on a first-on, first-off basis. What is the “waiting list”? It is a list of families who have contacted the fair office to let them know they are interested in getting a site. Currently there are 57 families on the waiting list. This is not as bad though as it seems. Many families who were offered a site for 2018 chose not to take the site for various reasons. These families were able to stay on the list in case something changed for them in the future and statistically do not often take a site in the future. If you want to add your name to this waiting list, email Brian Gardner at bgardner@gcffy.org with your name, address, best phone numbers to be reached (sometimes calls are made just before the fair starts so a cell phone is helpful) and your email address. Your name will be added in the order it is received. 2019 Fair Campsite Reservations will be mailed out later this month to families who camped in 2018. Families will be asked to review the information, agree to the rules and send the paperwork back to the fair with their $200 campsite reservation fee. Campers who hold a ten year lease with the fair have two more fairs remaining on that lease. 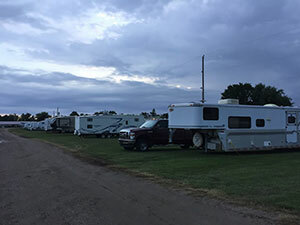 If you hold a ten year lease and no longer need to camp with the fair, contact the fair office and your unused portion can be refunded at the rate per year paid for the initial lease agreement. Please update your calendars so you can plan your mid-summer adventure at the next three GCFFYs. 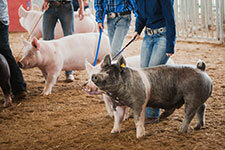 In May, the youth version of Pork Quality Assurance was no longer supported by the National Pork Board. Pork Quality Assurance is a certification program to educate swine producers how to raise a quality meat product. Historically, MSU Extension partnered with the Pork Board to provide the education of this program for youth participating in swine fair projects. The Pork Board eliminated this program when a new program, Youth for the Quality Care of Animals was created and covered all market animal projects. While this new program is well designed, the program costs $12 per child to participate and MSU Extension at this time is not able to provide the program education meaning it is only web-based. The fair decided since buyers are not getting additional money for reselling swine projects raised from "certified producers", that they would no longer require this certification of their exhibitors. At the last GCFFY Board of Directors Meeting, the board approved requiring record books for all exhibitors who exhibit market animal projects. 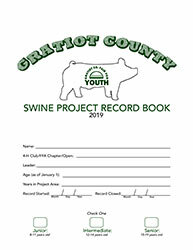 This means any youth selling an animal at the fair’s Livestock Animal or who is part of the fair’s dairy project must fill out a current year record book. Furthermore the fair's Market Record Keeping Sheet which was due on the last Saturday of fair will go away. The fair will soon post the updated record books online for the fair’s large animal projects and the details on how to turn the completed books. The fair is creating yet another form for youth exhibitors to complete. Any exhibitor who plans to show breeding stock (non-market) beef, dairy, goat and sheep projects at the fair MUST preregister their fair animals. This new form will be due on May 15 and will incur a late fee of $10 per business day up to 30 days in order to show at the fair. Paperwork received after 30 days past the registration deadline will not be accepted and animals will not be able to show. This will ensure large animals superintendents know how many animals to plan to have at the upcoming fair. This is a change so make sure you let anyone showing these types of animals know so they can plan. The new form can be downloaded by clicking here. The past few years has seen a huge increase in not only the amount of non-food still exhibit projects sold but also in the quality. GCFFY fair exhibitors have worked hard to master their craft to present some truly unique hand-crafted items for sale. This past year there was some confusion on the release of items at the fair. For the 2019 sale, exhibitors who will sell these non-food items will get a card when signing-up their exhibit sale project. This card will have a place for the exhibitor to complete their phone number(s) and name and a part for the buyer to write their contact information and name. The child will be required to give this card to the buyer after they sell so the buyer and the exhibitor have each other’s contact information. The card explains to the buyer it is the exhibitor’s responsibility to deliver the project after the fair but most importantly will provide both with contact information. The fair will also be encouraging still exhibit sellers to place a “Thank You Buyer” card on the project as well identifying the buyer of the item. The fair hopes this will help all sale projects to be delivered to the right place after the fair. The Fair will be changing the Still Exhibit Release time in 2019. The fair will be dismissing projects on the last Saturday of fair (Saturday, August 3, 2019) from 12:30 p.m. to 2:00 p.m. The fair has seen many projects leave the fairgrounds early the past years which has created a difficult time for our clubs who have done Barn Security. After 2:00 p.m., the barn will be closed until Sunday morning and will not be re-opened for project dismissal due to the large amount of visitors the fair has on Saturday afternoon. The Still Exhibit Barn will not be open to visitors on the fair's last Saturday. 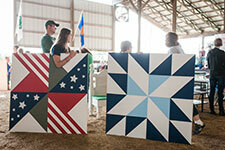 The fair has created an agreement between the fair and 4-H Clubs and FFA Chapters who participate in the fair. The new form will ask club leaders to participate in things they are already doing to help the fair. Club Leaders will agree to have their club perform their pre and post fair assigned clean-up duties for the fair. Leaders will also agree to have their families (or arrange for volunteers) participate in being Still Exhibit Barn Ambassadors (Barn Security) during their appointed barn hours. Club Leaders will agree to receive and distribute entry tags (etc.) delivered to them for their club. Furthermore club leaders will be expected to set-up, decorate and staff its assigned Still Exhibit Project Display Area. During Still Exhibit Judging the club will arrange for a volunteer to accept items being brought to the area for display. Club and Chapter Leaders will have an opportunity to learn more about this at a pre-fair club workshop for leaders in April with a goal to distribute printed fair books at this time. The fair will then agree to waive the fair’s $25 per member fair entry fee for all club/chapter members. In the past these were all previously waived for all 4-H and FFA members. The fair sincerely appreciates the help it receives from 4-H clubs, families, volunteers and staff and FFA chapters, members and staff. The fair cannot run without this incredible support. Gratiot County Fair for Youth awards a personal and business Appreciation Award annually during its opening ceremony. This year the fair awarded the personal award to the Cary Family. The Cary's have been involved at this fair since its inception in 1950. Four generations of the Cary family have given incredible amounts time, talent and resources to mold this fair into what the fair is today. The current generation of the Cary family continue in the large footsteps left by "grandpa" Charlie Cary. Today Charlie’s wife, Neoma, and their family, Scott and Wendy, Matt, Jake and Shelley, Stacey and Todd, Landen, Madelyn, Dillon (Denman), Hayley and Ben all contribute in the amazing Cary tradition of helping the fair. The Business Award was awarded to MJC Electric, LLC. Matt Campbell who owns and operates MJC Electric donated his time to help and resources to accomplish a large electrical project at the fairgrounds. Our phone number and email will remain the same at (989) 466-5071 and info@gcffy.org. Captured by Christine Crumbaugh has some amazing photographs from the 2018 fair. Many of them she posted are already on our fair’s Facebook account. There are many more on her website which were not on Facebook. Chris has been sharing her gift of photography for the last few years and this year's pictures are nothing less than exceptional. If you like one of them, you can download the full resolution file for $5 by clicking here. Chris donates all of the money to GCFFY. A HUGE thank you for Chris for all she does to save so many memories and moments from the best week of the year. Gratiot County Fair for Youth is constructing a new 64’ x 112’ multipurpose livestock facility. This new barn will replace the fair’s old beef barns and provide additional capacity to house livestock animals during fair. As part of this campaign, the fair has already secured funding and has purchased new livestock pens and a scale. Additionally the building will be constructed tall enough to support storage of large camping units over the winter. While the fair is well on its way to successfully funding this project from grants and philanthropic support, the fair still needs your help to complete the project’s funding equation. Various sizes and types of gifts are needed to complete the fundraising plan. There are numerous naming opportunities and all gifts will be permanently recognized. Gifts may be made in installments; however, we are asking donors to complete their gifts by October 31, 2018. As GCFFY is a 501(c)(3) public charity, your gift may be tax deductible. Click here for more information and to support this campaign. Last spring, Chloe Brittain and Dylan Macha were awarded a scholarship from the Gratiot County Community Foundation’s GCFFY Memorial Scholarship Endowed Fund. With these two recipients, this fund has now awarded ten scholarships since its inception in 2013. Recipients are awarded based on their long term diverse participation at the fair, commitment to community service and their leadership experiences. Anyone interested in applying for a scholarship next winter can find information at www.gratiotfoundation.org. Chloe Brittain is in her first semester at Trine University in Angola, Indiana where she is taking classes as well as running on their cross country team. 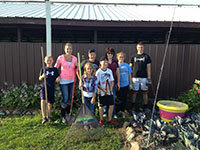 Chloe has participated in numerous project areas at the fair and is a long-time member of the Circle B 4-H Club. She has participated in the Gratiot County 4-H Teen Exchange Club. The last two years Chloe has coordinated the Science Expo for the fair. In this role, Chloe arranged the presenters who up an interactive science based table and worked with the fair to manage the logistics of having this event during the busy week. Dylan Macha has participated in the fair and 4-H long before he was old enough to start as a Clover Climber (which is now called Cloverbud). Dylan has participated in a wide variety of both still exhibit and animal project areas. Younger exhibitors look up to Dylan, and he is always willing to help these exhibitors learn more about the fair. Dylan has participated in two rotations of the Gratiot County 4-H Teen Exchange Club and as a member of the Double C 4-H Club. Dylan is furthering his education at Alma College where he is a recipient of their Community Engagement Scholarship. The Gratiot County community stepped up again to support GCFFY exhibitors at the fair’s livestock and still exhibit sales during the fair. This year buyers spent $451,130 on exhibitors’ project animals in the Livestock Sale and $114,525 at the fair’s Still Exhibit Sale. This year the fair sold 58,752 pounds of feeders, 49,849 pounds of beef, 29,686 pounds of swine, 9,813 bounds of sheep and 1,805 pounds of goats. Sale checks have been cut for all exhibitors; however, only checks for youth whose buyers have paid have been mailed. As the remaining buyers pay for their animals, those exhibitors’ checks will be released. Gratiot County Fair for Youth operates out of the Bill & Grace Vanderbeek Fair Office on the Alma Fairgrounds. The office will be closed on Tuesdays until we gear back up for the busy fair season. There are also other unplanned times throughout the week where Brian will be out running errands or meeting with stakeholders. It is advisable to call ahead if you are planning on coming over to the fair office. You can reach GCFFY at 989-466-5071 or by emailing Brian at bgardner@gcffy.org. On the south side of Alma sits a beautiful facility which might be the perfect location to host your next event. GCFFY’s fairgrounds is the perfect location for a company retreat or picnic, a peaceful meeting, a family reunion or of course an animal event. 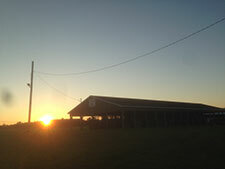 GCFFY has covered picnic areas; an all-weather, technology equipped conference room large barns and arenas. Our online calendar has all of our events listed at www.gcffy.org found by clicking on Upcoming Events tab. If you would like to see how GCFFY could serve your needs, contact Brian Gardner at the fair office at 989.466.5071 or bgardner@gcffy.org. Any 4-H club or FFA chapter who is looking for a meeting location or a place to hold your next club event is encouraged to consider the fairgrounds. The cost for 4-H and FFA groups is often waived depending on the scope of the event and the amount of work it will take fair staff to clean-up after the event. The Gratiot County Fair for Youth and the Gratiot County 4-H Programs both have active Facebook accounts. These accounts are used to provide you with current information about their respective programs. Everyone wants to be liked so please "like" them and make sure you are receiving current information. If you have "liked" us on Facebook and we do not show up on your feed, go to our page and like a post or two or make a comment. Active participation on a page will ensure you are receiving the information we are distributing. The Gratiot County Fair for Youth's Facebook page is https://www.facebook.com/gcffy and the Gratiot County 4-H page is https://www.facebook.com/GratiotCounty4H.